The Island Grillstone take on a not-so-traditional slider! Avocado, smoked mozzarella cheese, lettuce and tomato tower over a burger larger than a hand. This one defies the odds of easy eating but is packed with flavor! Cook onions and hamburgers are done to your personal preference. 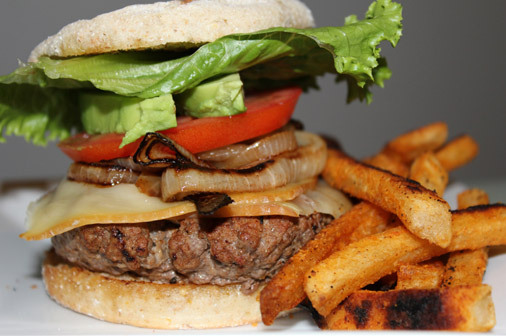 140 – 145 degrees is about medium for the burgers. The rub should have created a nice crust! I served mine with seasoned fries baked on the grill at the same time!